Chapters is a boutique hotel in the market town of Stokesley, at the foot of the North Yorkshire Moors. 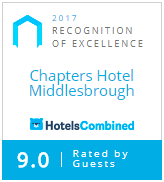 Chapters is a peaceful retreat which is within 30 minutes drive from the centres of Middlesbrough, Darlington and Northallerton. The hotel is perfect for the business traveller or for those of you who fancy a well-deserved break. Formerly a coaching inn, the Hotel is a unique and inspirational venue in a magnificent listed building dating back some 250 years. The Seasons Bistro and Leven Restaurant are perfect for dining, special breaks, weddings, celebrations and business meetings. Sorry, we don't have any upcoming events, please check back soon. Licensed for Civil Ceremonies, whether it’s a smaller, more intimate celebration or exclusive use of the hotel, we would like to offer you the opportunity to spend the most romantic day of your life with us at Chapters. Nestled at the foot of the North Yorkshire Moors Chapters is in a perfect location to access many of the main attractions that the region has to offer. We’re proud of our hotel and the local area, here you’ll find photos of the Market Bar & Grill, our rooms and our beautiful secluded garden by the River Leven.